In the intensive culture systems, excessive feeding leads to ammonia accumulation, which results in lipid metabolism disorder. However, little information is available on the modulation of lipid metabolism in fish as affected by feeding frequency and ammonia stress. In this study, weight gain increased as feeding frequency increased from one to four times daily, but feed conversion ratio is opposite. The highest survival was found in ammonia group when fish was fed two times daily. 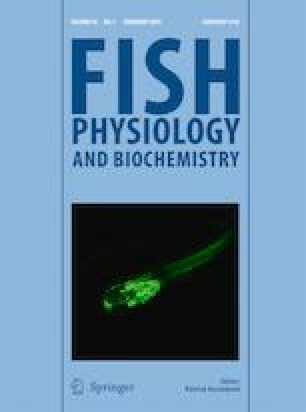 Liver ammonia content increased as feeding frequency increased from one to four times daily, and the highest brain ammonia content was found when fish was fed four times daily. The highest liver 6-phospho-gluconate dehydrogenase (6PGD), fatty acid synthase (FAS), carnitine palmitoyltransferase (CPT), and lipoprotein lipase (LPL) contents were found in control group when fish was fed four times daily; in comparison, the highest liver 6PGD, FAS, CPT, and LPL contents were found in ammonia group when fish was fed two times daily. Liver 6PGD, FAS, CPT 1, SREBP-1, and PPARα mRNA expression in control group increased significantly as feeding frequency increased from one to four times daily, and the highest expression of 6PGD, G6PD, and FAS was observed in ammonia group when fish was fed two times daily. This study indicated that the optimal feeding frequency is two times daily when yellow catfish exposed to ammonia. This research is based on work funded by the National Natural Science Foundation of China (grant No. 31502176), the Natural Science Foundation of Ningbo City (grant No. 2016A610083). This research was also sponsored by the K.C. Wong Magna Fund in Ningbo University.